PPC standard suspension insulators with high mechanical and electrical strength are designed to meet the most modern demands for distribution line usage today. 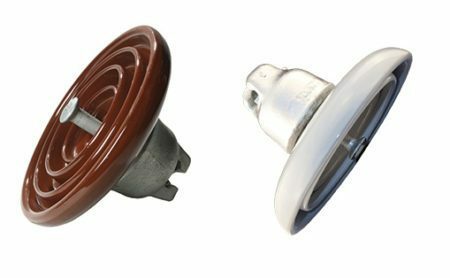 PPC makes ANSI approved Ball–Socket and Clevis type distribution suspension insulators for overhead distribution systems in the world. Each suspension shell undergoes rigorous electrical testing before and after assembly before being shipped. PPC one – piece design tie – top line post insulator eliminates the need for suspension shells while providing maximum protection under severe flashover and mechanical impact. Designed for upright or angle mounting on a crossarm, a choice of stud assemblies is available for both wood and steel crossarms. All Line Post Insulators are manufactured by PPC in strict compliance with ANSI standards. PPC offer horizontal & vertical clamp top linepost assemblies for ratings 15 kV through 145 kV. PPC Santana horizontal mounting line post assemblies are primarily recommended for downleads, jumper loop control and similar applications. A galvanized metal cap is cemented to the outside of the line post head supporting the trunnion type clamp. PPC Santana vertical clamp top line post insulators are mounted upright on crossarms and structures. Rated at 2800 lb. cantilever strength these insulators offer strength with excellent mechanical as well as electrical characteristics. PPC manufactures a wide range of low and high voltage Pin Type insulators designed for distribution. The versatile neck designs in “C, F, K and J”, side and top grooves, accepts large diameter conductors for easy tying. All neck sizes comply with industry standards: factory formed ties can be used. 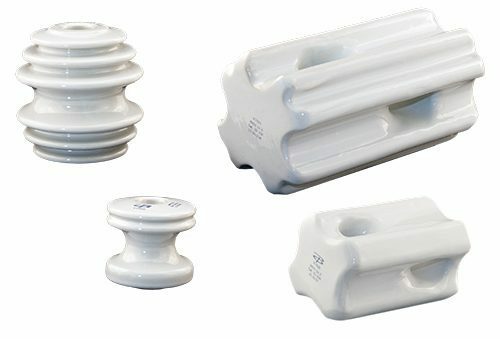 PPC Insulators makes spool and guy strain insulators out of the highest grade electrical wet-process porcelain in a wide range of electrical values which is resistant to mechanical breakage. Strength ratings are made in accordance with ANSI Standard C29.4 for ultimate strength.